This San Antonio Bars & Clubs Maps hows the location of popular Bars, Pubs, Clubs, Nightclubs & Discos. Click the name in the right column to highlight the location on the map. San Antonio is the Worls Party Capital. Once the domain of young Brits, but now the Germans, Scandanavions have also discovered the party atmosphere of this amazing town. West End is the nightlife area of San Antonio, centred around Carrer de Santa Agnes & starting about 100 metres from the Sea Front. West End Bars. Sports Events such as Rugby World Cup, Football, Cricket, Boxing & UFC are shown on their 2 giant screens & 5 Televisions. Food: Home made bar snacks, pies & soup with rolls. The West Ends busiest party club, said to be the original and best. La Noche (The Night in English is a Spanish Dance bar) with Spanish Music. British Sports Bar with 3 Full HD televisions. The Boozer - Live Football, British Pool Table. This is the area to start out the evening before heading into the West End or the Islands Clubs. Drink prices can be over the top in these atmospheric venues. Those on a budget holiday can buy some drinks and food at the supermarket and sit on the rocks. Some of Ibiza most famous DJs play music at these venues before moving on to the clubs. 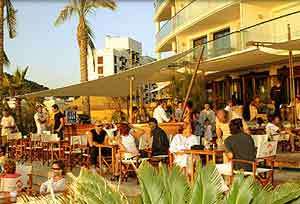 The Cafe del Mar was the original Sunset Cafe bar and still a crowd puller to it's esquisit designed premices. 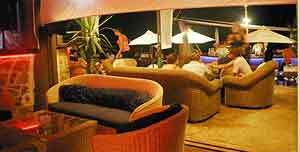 The Cafe Mambo is the most famous on the Sunset Strip hosting the fabulous Radio 1 parties. The Cafe Savannah has a vast number of tables along the Sunset strip promenade ideal to watch the glorious sunset while havingf an evening meal. The Kanya Beach Bar restaurant is part of a small 12 apapartment complex & is a venue for some great official club pre-parties in Ibiza. They have live muaic, sports large screens and air conditioning. The Sunseabar is located at the Northern end of the Sunset Strip & next to Kanya Bar. A different DJ plays their individual music style each day of the week. The restaurant specialises in Spanish cuisine sea food such as lobster paella, sea bass with prawn sauce, grilled prawns, oysters and clams. They also offer a snack menu that includes homemade Pizzas, Hamburgers and Sandwiches.